US inundates terrorist legions with cash & support after regional embassy attacks and death of own ambassador. September 28, 2012 - US Secretary of State Hillary Clinton announced that the US would be providing an additional $45 million in "non-lethal aid" to the "opposition" in Syria, reported the Associated Press. The Western press chose their words carefully, ensuring that the term "civilian opposition" was repeatedly used to describe the armed terrorist forces attempting to violently overthrow the Syrian government. 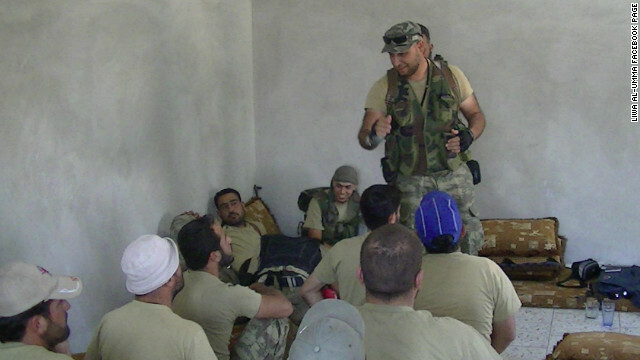 Image: Libyan Mahdi al-Harati of the US State Department, United Nations, and the UK Home Office (page 5, .pdf)-listed terrorist organization, the Libyan Islamic Fighting Group (LIFG), addressing fellow terrorists in Syria. Harati is now commanding a Libyan brigade operating inside of Syria attempting to destroy the Syrian government and subjugate the Syrian population. Traditionally, this is known as "foreign invasion." US aid is going to foreign terrorists, not a "civilian opposition." In reality, the "opposition" in Syria constitutes foreign terrorist legions flowing across Syria's borders, and in particular, staging and crossing over from NATO-member Turkey. In fact, it was recently admitted by the terrorist legions themselves that their headquarters has been located within Turkish territory for the duration of the conflict. In a recent France 24 article titled, "Free Syrian Army move HQ from Turkey to Syria," armed militants claimed they had only just recently "moved from Turkey to within Syria." Clinton's Aid is Going to Al Qaeda, Not a "Civilian Opposition." Photo: The face of Libya's "revolution" was literally Al Qaeda. 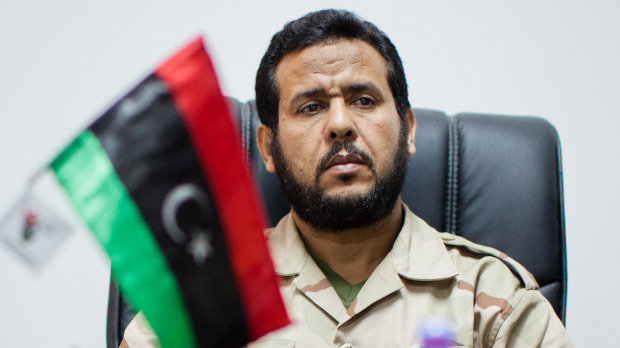 Al Qaeda's LIFG commander, Abdul Hakim Belhadj, was NATO's point man in Libya and has now redirected his terrorist forces against Syria. LIFG commanders are now literally running entire brigades in Syria with Western diplomatic, logistic, and military support. The apparent surge in Libyan recruits traveling to Iraq may be linked the Libyan Islamic Fighting Group’s (LIFG) increasingly cooperative relationship with al‐Qa’ida, which culminated in the LIFG officially joining al‐Qa’ida on November 3, 2007. US Support of Al Qaeda Announced on Heels of US Ambassador's Death. Image: Bi-partisan treason. 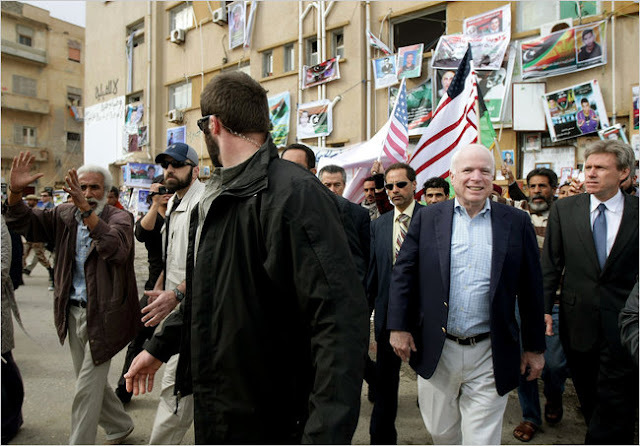 Senator John McCain pictured alongside the now deceased Ambassador Stevens (right, wearing a blue tie) had been in Benghazi, Libya supporting Al Qaeda militants since 2011 and highlight that the US' current support of global terrorism is bi-partisan in nature. It does not stem from a "secret plot" hatched by current US President Barack Obama, but is merely the latest leg of a singular agenda dictated by corporate-financier interests that transcend presidencies. The violent destabilization of Syria in fact began in 2007 under US President George Bush. It is quite clear then, that the NATO-backed 2011 "revolution" in Libya was merely the continuation of Al Qaeda's campaign against Qaddafi, this time assisted by US, French, and British jets and special forces, with an infusion of Western, Qatari and Saudi cash, "non-lethal" aid, and weapons. The West, with a sound understanding of LIFG long predating their support for Al Qaeda in Libya in 2011, knowingly aided and abetted terrorists with Western blood on their hands who were long-listed on various Western foreign terrorist organization lists. Hillary Clinton is handing millions in cash to known Al Qaeda terrorists, on the heels of these terrorists claiming one of her own ambassadors in the middle of LIFG's terror emirate - this while the West berates Iran for supporting the government of Syria as it attempts to defend itself against what is clearly a foreign invasion, not a popular uprising. While it may seem an act of unhinged insanity - it is not. It only seems "insane" if one believes the narratives spun by Western politicians who are attempting to sell their agenda from various, not always mutually conducive angles. If one however understands that the corporate-financier interests of Wall Street and London are pursuing global hegemony at any cost, the use of Al Qaeda terrorists who have just led mobs attacking Western consulates across the region that claimed the life of one of America's own ambassadors makes perfect sense.